In DUG Insight, different aspects of views can be linked. Views with linked parameters will automatically follow changes to that parameter in other views. For example, all views with “Vertical position” linked will scroll vertically when any of them are moved. To create an independent view that does not follow changes, uncheck all link options. Available links depend on the type of view. Note: Only one 3D View can be opened at any one time. Use links to update the 3D View display settings to changes in other “linked” windows. Right click in any section view and select Display Settings. In the Links tab, select the relevant check boxes to link. Toggle the Select all option to link all or none of the above to the view. 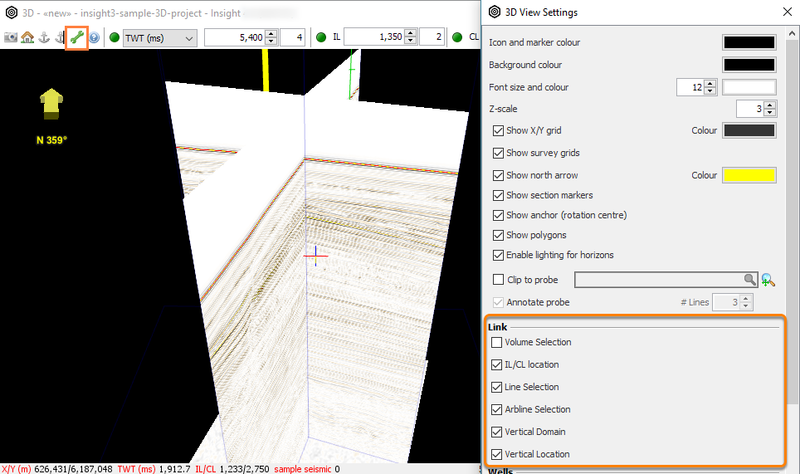 The Volume Selection check box is selected for all 2D Line Views so that they all display the same 2D Volume. 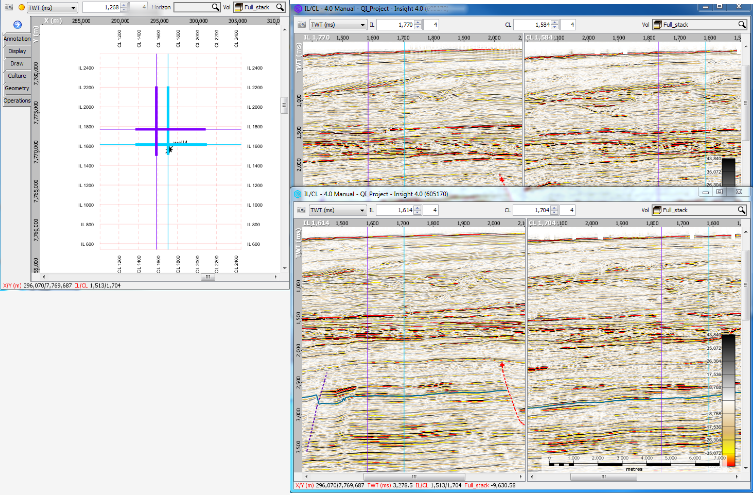 However, we have unchecked Volume Selection for Map View and Arbline View so that they may display different volumes. The Line Selection check box is unchecked for all 2D Line Views so that they can display different lines in each window. Tip: Shift Click in Map View will update 2D Views that have the link Line Selection enabled. The Domain, Location/Position and Scale are linked for all the views, so any navigation will be reflected across all views in the same domain. Tip: Duplicate windows can be opened and they preserve the linking options of the original windows (see Duplicate Windows). When using two IL/CL Views with IL and CL location unlinked, the navigation markers will inherit the colour of the IL/CL View. Navigation markers can be moved by clicking and dragging the marker. Double clicking will update the first IL/CL location only. 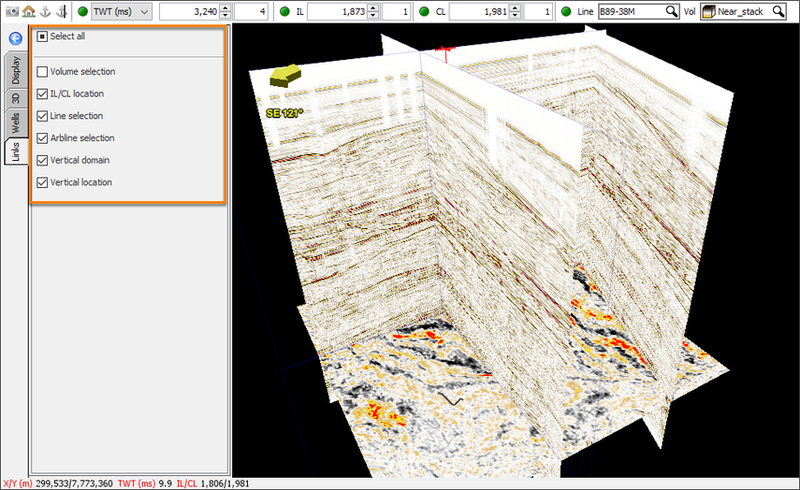 Multiple Il/CL Views can be displayed at any one time, with each view represented as a highlighted IL/CL on the Map View. 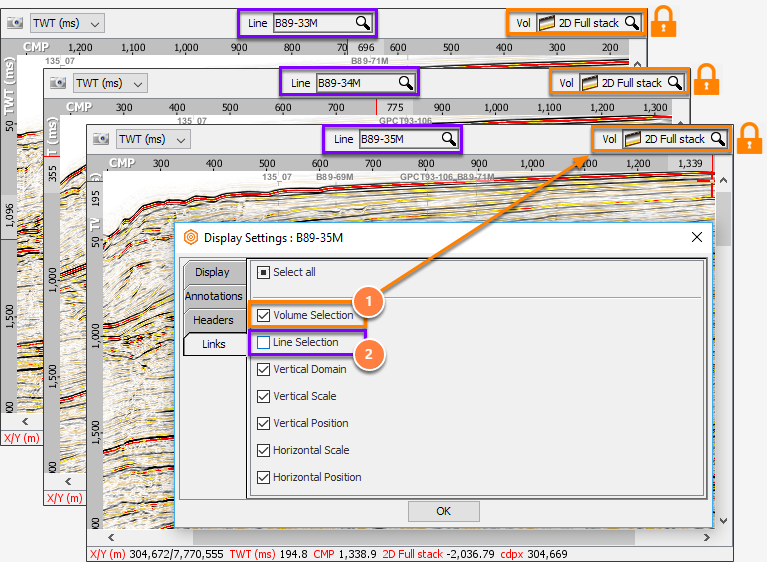 The lines can be individually controlled, or collectively controlled based on the IL/CL location linking option set for each IL/CL View. If both are not linked then double clicking on a location in the map view will cause neither IL/CL to update location. If one IL/CL window has IL/CL location link enabled, only this View will update when double clicking on Map View. If both IL/CL Views have IL/CL location link enabled, both views will update when double clicking on Map View. Note: When both IL/CL views' IL/CL locations are unlinked, the IL/CL can be moved by hovering the mouse over each line and dragging individually. To move the lines on the zoom sections (thicker lines on Map View), hold left-button and drag. 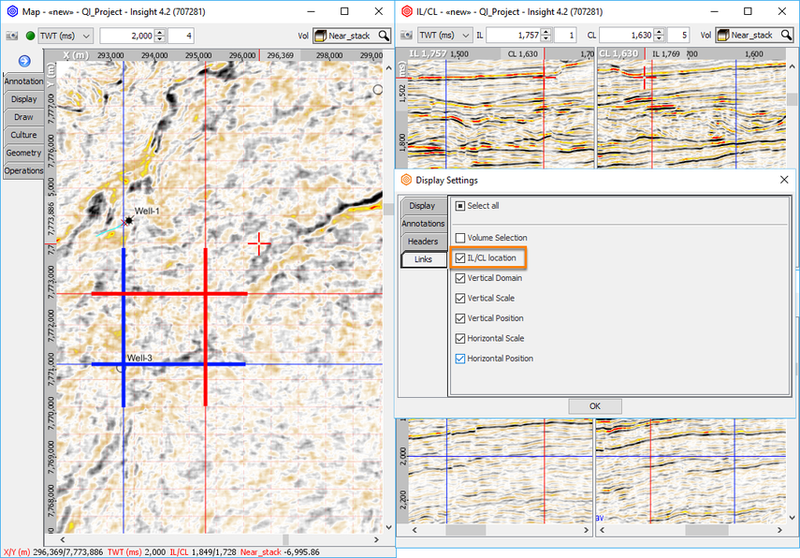 In the example above, we have unlinked Zoom so that the second Map View window can display a more zoomed out view of the data. When Zoom is unlinked, the Position check box is disabled (because linking position will automatically link zoom). When Zoom is linked, both Map Views will display at the same zoom level at all times, but you can still navigate to a different position. When Position is linked, both Map Views will always show the same area at the same zoom level. 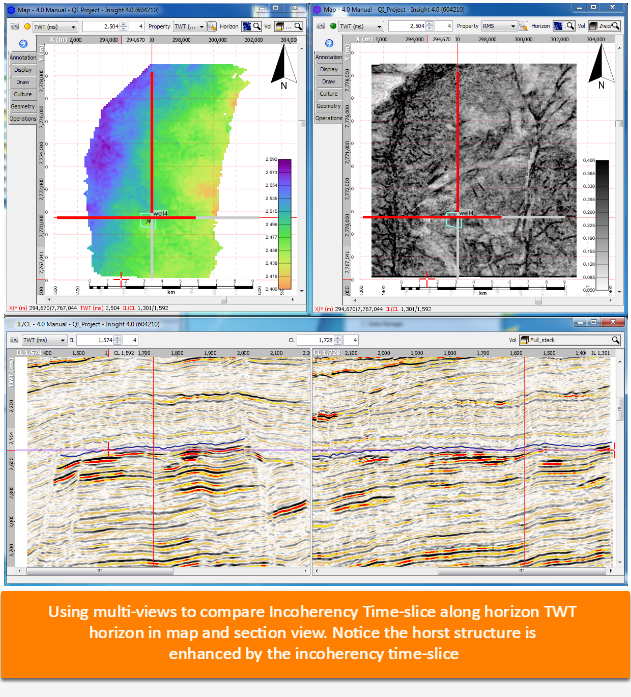 The example below shows two Map Views with Zoom and Position linked, but showing different horizon properties. Note: The thicker navigation line seen on the Map View is the scroll position of the section views. 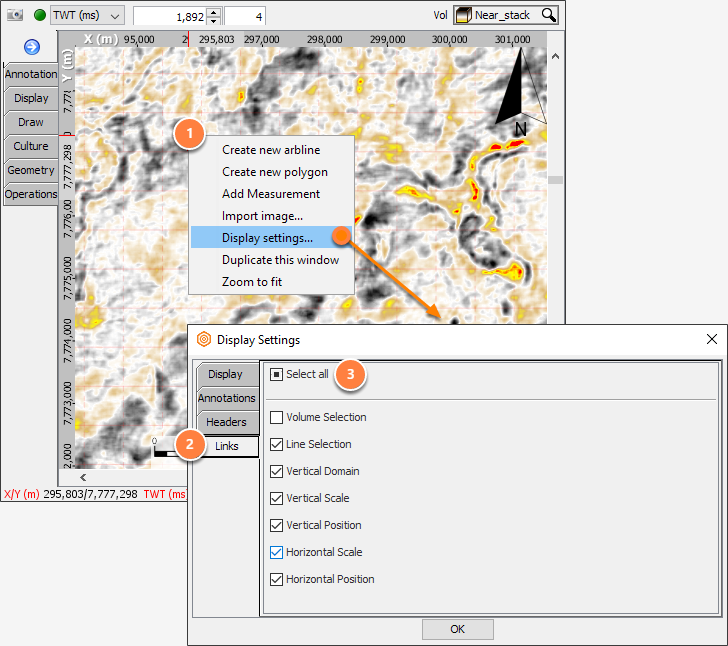 This option can be disabled in the Display tab > Scroll Positions of the Map View. In the 3D View, click the Links tab. Sselect the check boxes to link the volume, line/arbline, domain, or location with other views that have the same check boxes selected.